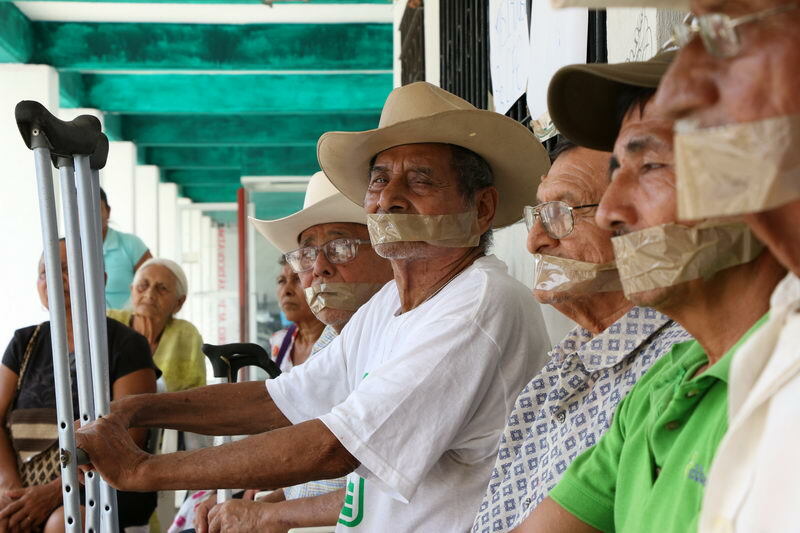 On 3 November, elder males and females who have been affected by the construction of the Chicoasén II dam in the Chicoasén municipality undertook a hunger-strike to demand the release of their lawyer Arturo Ortega Luna, who was arrested on 21 October. In an urgent communique, the campesinos reported that “those who will be on hunger strike are at risk of having charges fabricated against them by the government, as it did the last time with the State Attorney General’s Office, given that municipal and state police and the Mexican Army are patrolling through our streets.” They indicated that the detained lawyer, who was assisting them in their defense against the construction of the dam-project, “was arrested unjustly, accused of a mutiny by the Federal Electricity Commission (CFE).” The ejidatarios demanded that the more than 10 arrest-orders against other members of the ejidal committee and associated lawyers be suspended. 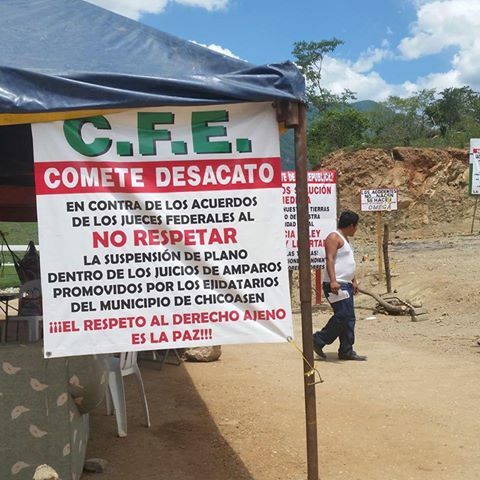 With their hunger-strike, the ejidatarios denounced the judicial persecution and threat against their agrarian rights, in light of the looting of land implied by the project. They have demanded just reparations for the loss of their lands as well as respect for the legal motion affirmed by a federal judge in May 2015 mandating the suspension of the dam-project. Avisaín Solís López, an ejidatario who has been affected by the dam’s construction, added that the state governor, Manuel Velasco Coello, “said that he would not allow the construction of any more dams that would violate the rights of peasants in Chiapas, but now we defend our rights, having received only lies.” Those affected seek to maintain their hunger-strike until the government attends to them, releases their lawyer, and respects their rights as indigenous people. Ejidatarios from San Sebastián Bachajón, who struggle against the imposition of tourist megaprojects on their land, have been denied the legal motion they had presented to the courts in March 2011. After three cancellations, an attempt to transfer the case to the Supreme Court for Justice in the Nation, and despite the the detection of violations of due process, a federal tribunal denied the motion 274/2011. In a communique released on 10 April, the anniversary of the murder of Emiliano Zapata, the ejidatarios reported their knowledge of the refusal of the motion, reaffirmed their commitment to the struggle against the State, and denounced that official authorities are meeting with party-members from the region, seeking to develop strategies to crush their own autonomous process. 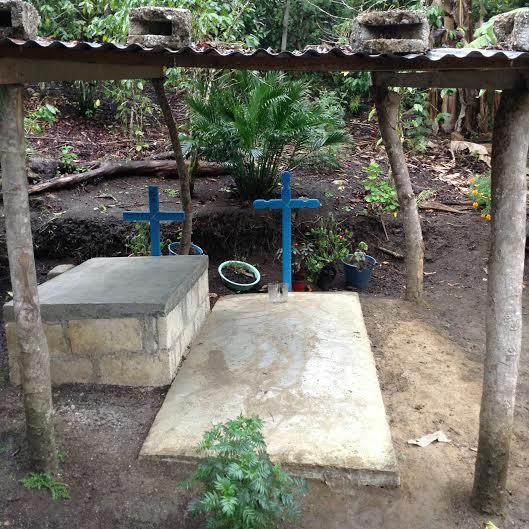 This struggle over the management of lands surrounding the Agua Azul waterfalls has resulted in three violent displacement operations, two murdered communal leaders (Juan Vázquez Guzmán, killed on 24 April 2013, and Juan Carlos Gómez Silvano, killed on 21 March 2014), and several political prisoners. Recently, the ejidatarios also had their regional headquarters burned down, in an operation that involved 600 police, who threatened two autonomous journalists and took their equipment. In the latest communique, released on 11 April, the ejidatarios make an invitation to the commemoration of the murder of Juan Vázquez Guzmán. On 24 April, the second anniversary of his, a mass will be held in the family home of Juan Vázquez Guzmán at 3pm. As a means of popular pressure, a petition has been launched on www.change.org, and the Chiapas Center for Women’s Rights seeks signatures for its communique in support of the ejidatarios. Those interested can email adorsetchiapassolidarity@aol.co.uk. 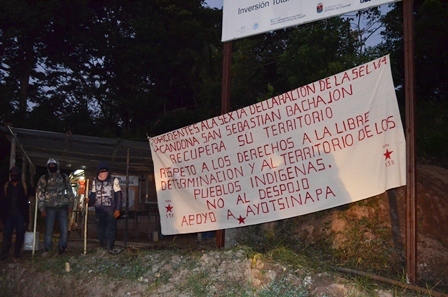 Early in the morning on 9 January, at least 900 officers from the Chiapas state police as well as federal forces displaced the camp that indigenous ejidatarios from San Sebastián Bachajón, adherents to the Sixth Declaration of the Lacandon Jungle, had installed at the entrance of the eco-tourist park, the Agua Azul waterfalls. 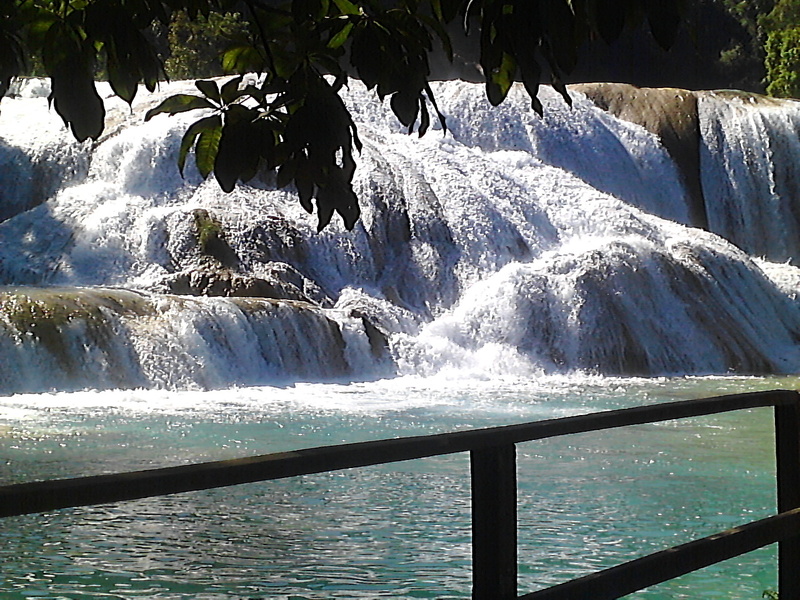 Though the site belongs to the Tumbalá municipality, one must traverse the Bachajón ejido to access the waterfalls. On 21 December, more than 300 ejidatarios had retaken the lands, explaining that they “had been plundered by the bad government beginning on 2 February 2011, with the complicity of the ejidal commissioner of San Sebastián Bachajón,” making reference to the control-point that had been administered by the ejidatarios since September 2009 until the day they were forcibly displaced, leaving one dead, at least two injured, and 117 arrested. Within the context of this new displacement, initial reports had indicated the forcible displacement of eight individuals. During the night of the displacement operation, these persons in question were found, and they explained that they had succeeded in escaping the police after they had been arrested. Following the displacement, the police established surveillance in the zone and installed checkpoints to review the vehicles that pass through. On 21 December, more than 300 persons from the San Sebastián Bachajón ejido peacefully recovered the lands which belong to the ejido within the Chilón municipality on which are located the access-point to the Agua Azul waterfalls eco-tourist center. In a communique, the ejidatari@s reported that they had decided in an assembly to recover this space, given that these had been “plundered by the bad government since 2 February 2011 with the complicity of the ejidal commissioner of San Sebastián Bachajón,” thus making reference to the control-point that had been administered by the ejidatari@s since September 2009 until the time in which they were displaced, leaving one dead, at least 2 injured, and 117 arrested. Subsequently, the National Commission for Protected Natural Areas (CONANP) installed its own control-point, and the Institute for Civil Protection (IPC) and the Secretary for Citizen Security and Protection (SSyPC) established a permanent presence at the entrance of the eco-tourist center. Given that these are vacation dates, it is feared that a displacement operation will follow that could be violent. 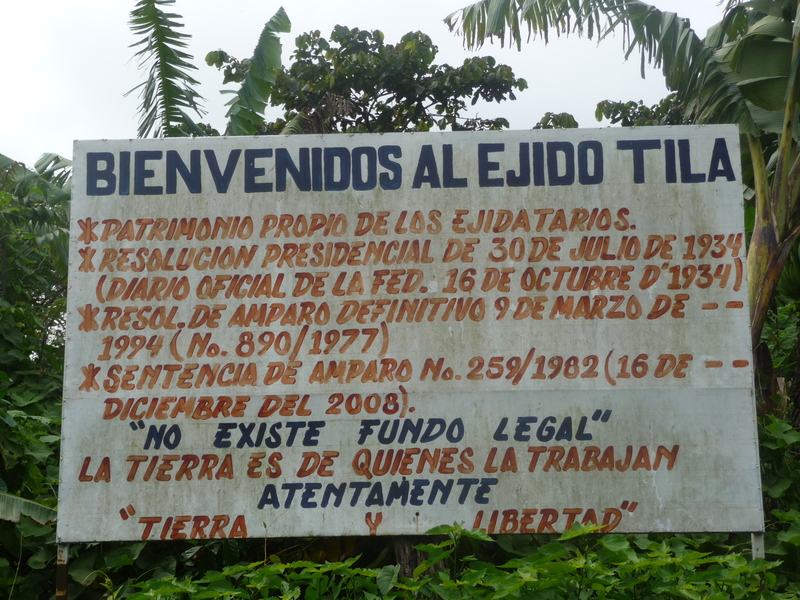 The ejidatari@s of Tila, adherents to the Sixth Declaration of the Lacandona Jungle, denounced that on 31 August a meeting was held between former ejidal commissioners and a group of approximately 150 others, toward the end of deposing the present ejidal commissioner.